PediaPress Blog: It's 2011! What Book Best Illustrates This Past Decade? It's 2011! What Book Best Illustrates This Past Decade? We looked back at the year 2010 and tried to see what happened at PediaPress. Wow. New people joined the team, the rendering software kept getting better, we implemented hard covers and color content, and of course, the number of Wikipedia articles to choose from to make custom books kept increasing, making PediaPress wiki books ever more interesting. And then we decided to look at the world around us (yes, there is a world beside work!) and wondered what had made this last year, and even this last decade, special. We all had different ideas and memories of the 10 years past. It's actually quite an interesting exercise to look back and see what people remember, or don't for that matter. So we made a book. 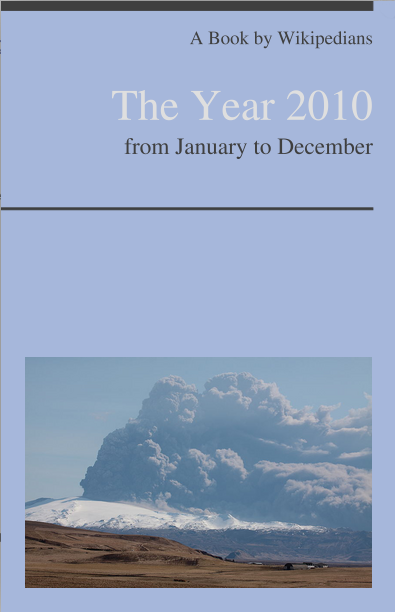 Our book is quite an exhaustive one, albeit a simple one - we just put together all the "month articles" from Wikipedia in a book. Well two actually, since so much happened that it only fits in two volumes. So we've done ours, but we'd like to know what you remember of the last year, and of the last decade. We thought we'd throw a little memory contest out there, to see what you will come up with. Make your own book about what you think was important in 2010, or in the last decade (2000-2010). Any focus is allowed. It can be "The Craziest Moments of The Last Decade", "The Most Influential People At The Turn Of The Century" or "The Year 2010 Coolest Cars". Whatever was important to you, what you found interesting, what you'd like to keep in your library to show your kids, grand-kids or just your friends in ten years time to say "this is what I remember of those years". Only one condition: The book can't exceed 800 pages (yes, I know, we've cheated our own rules with our book, but then, we make the rules, so there!) - that is one volume. Make a cool cover, and link it from our Facebook page or in the comments of this blog post . We're curious to see what you will come up with. You have time until the end of the month to show off your best book. We'll choose the coolest books and the coolest get a copy for free. So go for it, start the book creator and show us what we've missed in this crazy last decade and last year. Ready? Go! Why do you collect the entries at facebook? There are a number of Wikipedians who don't have and don't want a facebook account or have one but don't want to see it connected with their Wikipedia activities and identity. Free culture means not to use facebook. You have a point. We like Facebook because it integrates pictures and such. And no, I don't agree with your statement "Free culture means not to use Facebook", but it's another debate :P. However, yes, I do agree that we should give other options. So here goes, please if you don't have a Facebook account, just posts the link to your book in the comments here! The blogpost has been edited accordingly.